Ronald Schmits spent a lot of time in Ambrose Hall. He grew up in Davenport and attended St. Ambrose Academy. Staying in Davenport and attending St. Ambrose College was an easy decision. "It was all down to economics in those days," said Ron. "I'd save money by living at home, and I could keep the part-time job I'd had throughout high school." 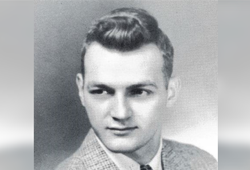 Ron majored in Natural Science (now they call it pre-med) and, after graduating in 1960, went off to the University of Iowa where he earned a degree from the College of Pharmacy. He completed an internship at the Davenport Walgreens, and then began a 32 year career at Abbott Laboratories. "I always enjoyed my time at St. Ambrose, both at the Academy and the College," said Ron. "More than that, it was the springboard I needed to enter and succeed in my chosen profession. I'm thankful for that and feel like I owe St. Ambrose a lot." Ron has supported the Ambrose Annual Fund for some time, joining the President's Club in 2016. Recently, Ron reached out to St. Ambrose to inquire about setting up an endowed scholarship. "I was aware that an endowment fund was created to honor my brother John when he retired in 2004," said Ron. "I did not know how easy it was to set up. If I did we would not have taken so long to do it!" Ron and his wife Linda established the Schmits Family Endowed Scholarship to honor Ron and his brother John Schmits, a longtime art professor and 1957 graduate of St. Ambrose. The Schmits Family Scholarship will be awarded to a student, preferably one studying art or pre-med/dental/pharmacy, is in good academic standing, and with a demonstrated financial need. The Schmits family funded the scholarship through a gift of appreciated stock. "I truly value the principle of teaching with a Christian base - having that philosophy behind all areas of education," said Ron. "That education made a difference in my life, and I was proud that John continued there and was part of that process." Ron's advice to others that feel the same way? "Don't wait as long as I did to do it. For me, it was easy to do with appreciated assets. The best part is we'll be able to hear from the students receiving the award and know that we're making a difference."